Description: Did a mummy’s curse cause the Titanic to sink? Why was the Titanic carrying dragon’s blood? Is it true that there was a murderer on the ship? Can you smell icebergs before you see them? Here is the one book with all the answers to your questions about the Titanic! Here, too, is the complete, heart-stopping story of the legendary ship—from its building, maiden voyage and tragic sinking, to its high-tech discovery and exploration on the ocean floor. Special features include the making of James Cameron’s movie Titanic, a true-or-false quiz, and the real-life stories of the young people who sailed on the fateful voyage. Illustrated with dozens of paintings, diagrams, and rare photographs. Jake's Review: Seriously mom -- another one -- you know you have a problem right? Yes, I will give it a fair chance and pretend that my mom isn't weird. Ok this book is easy to read and there are lots of pictures to keep me turning the pages. 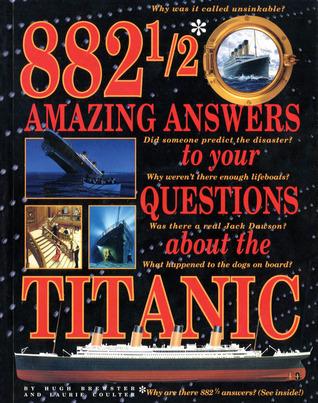 This would be a really good book to learn the facts about the Titanic, and how and why it sank. I think it would be a good book for Teachers and Librarians and its not even boring. It's neat to see the pictures of what the ship looks like underwater now & sorta creepy. It's really sad that so many kids died - especially when a bunch of rich guys didn't (Shhh don't tell mom -- she will go on and on about that Ismay dude) Just so you all know my Mom sings that Titanic song all the time and she has Titanic ice cube trays. Mom's Review: Nice kid eh? Ok he really does have a point - damn I hate it when kids are right. I hereby declare that I no longer will make my kid read books about the Titanic & if I do - I owe him huge. Also this book is going on MY shelf and not his. I loved this book - but really did you think I wouldn't. 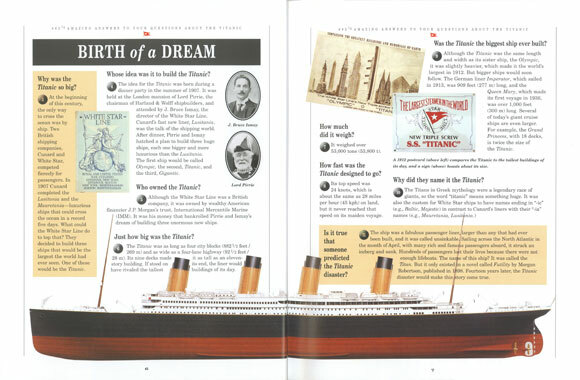 It's full of all sorts of facts and figures about everything Titanic related. It is very colourful with lots of pictures, diagrams, etc that will keep even the more reluctant reader interested. I even learned a few new things, for instance I didn't know the Titanic was 882 1/2 feet long (you get the title now don't ya?) It is a good introduction to the Titanic disaster and would be a very useful tool for both Teachers and Librarians (and a nice addiction to fellow Titanic freaks bookshelves) The Index is pretty detailed and the glossary and recommended reading section are extremely helpful for the intended audience. And yes I will probably go to see Titanic in 3D on April 14th because as my son said I'm weird. Nicole & I just went to see Titanic last night.. brought back so many memories, and caught so many additional details ... this book totally sounds like something I'd enjoy! Thanks! Wish I could have gone with you guys, I love that movie, I am not ashamed to say LOL!